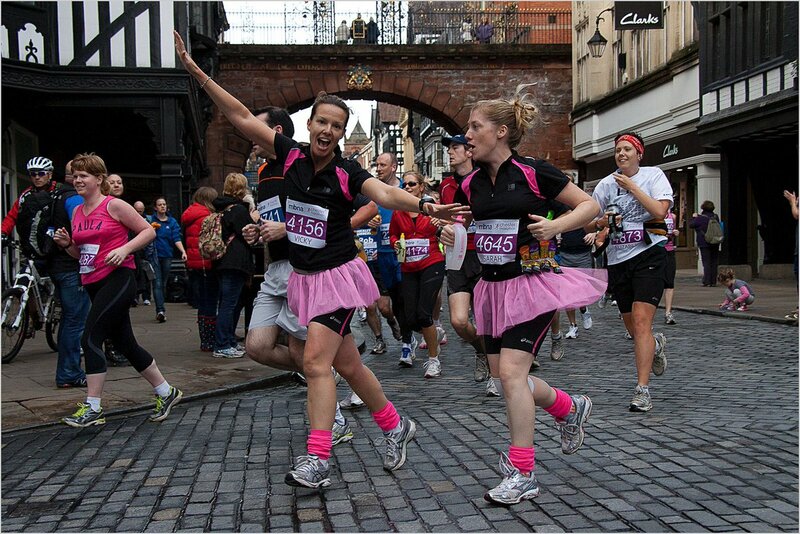 The MBNA Chester Marathon is the UK's favorite marathon, always voted as one of the Runner's World top 10 marathons. With a spectacular start and finish at Chester Race course, the route passes all Chester's iconic landmarks, then heads out into the Cheshire & North Wales countryside, before returningalong the banks of the River Dee for an unforgettable finish. The multi-award winning and UK’s only international marathon from the historic Roman/Medieval international destination City of Chester. As runners ourselves we are passionate about delivering what for us would be the perfect race; a premier quality, competitively priced race which caters for the needs of runners of all abilities and speeds, combined with friendliness and personal touches which are unique to us. The fast and largely flat spectacular city and rural race route combined with enthusiastic support and regular drinks/nutrition stations helped a record 70% of our runners achieve personal best times. With our web site packed with all the information you need about the race, our free monthly paced training runs, seminars and team of race day pace runners, we are here for you to help you achieve your goals and enjoy the race day experience. Thanks to the dedication and enthusiastic support of our team and 700 volunteers, combined with feedback from runners and the backing of many we are proud that Runner’s World runners have previously voted us the UK’s best marathon and best road marathon. 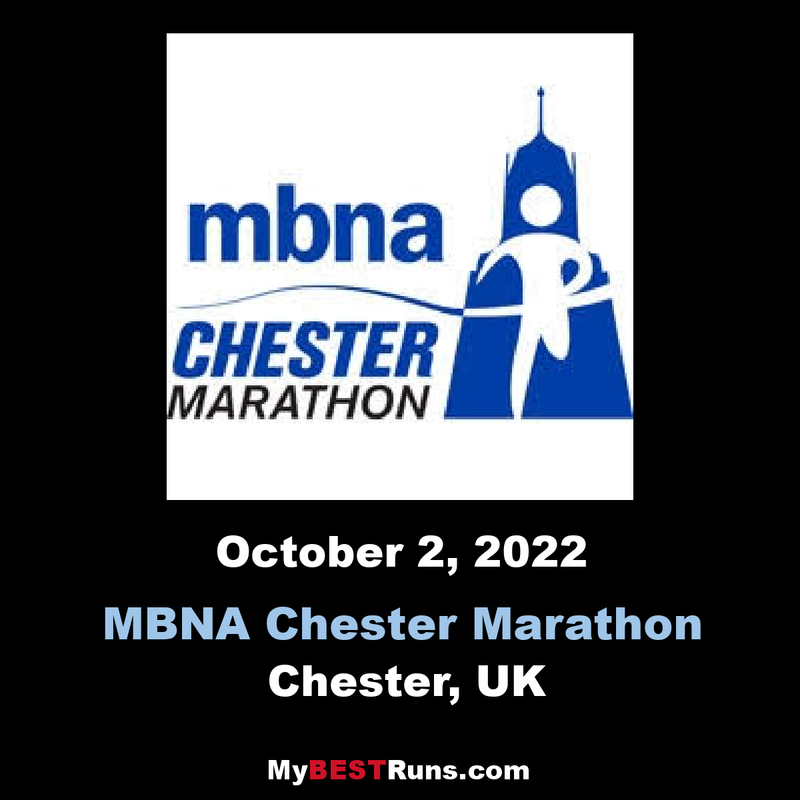 We are looking forward to the annual MBNA Chester Marathon in October and hope that you choose to run with us. The MBNA Chester Marathon started as an idea in the minds of friends Andy White and Chris Hulse. As keen runners and triathletes, they wanted to address the lack of a marathon in Cheshire by organising what they consider to bethe perfect race. In 2010 the first Chester Marathon was held on the late May Bank Holiday Monday. Starting and finishing at Chester Rugby Club it ran through the village of Guilden Sutton and along theChester Millennium Greenway path to the River Dee.The 2010 race exceeded all expectations with all the 1,000 places selling out, great runner feedback and a place in the Runners' World Top 10 marathons of 2010. Building on the success of the inaugural MBNA Chester Marathon it was clear a new route needed to be found which could cope with increased numbers, whilst also showcasing Chester's iconic attractions. 2011 was the first outing for the new course, which has remained unchanged since. In 2014 a Metric Marathon was added – at 26.2km (16.3 miles) this provides an additional step for runners wanting to move up fromthe half marathon distance. From the start line the race heads through the town, passing the local Town Hall. The runners also pass Chester Cathedral, the split level Middle Ages "Rows", Eastgate Clock, Amphitheatre and go through the ancient Roman Walls four times before leaving the City and heading across the Old Dee Bridge.Runners then head out of Chester, via Pulford, crossing the border into the Welsh villages of Lavister and Rossett. The route then follows a small loop reaching the old village of Holt before crossing the ancient Roman bridge at Farndon, leading back to England. Our spectacular marathon route is both historic and scenic. You can expect some fast times over this stunning PB marathon course on closed roads. 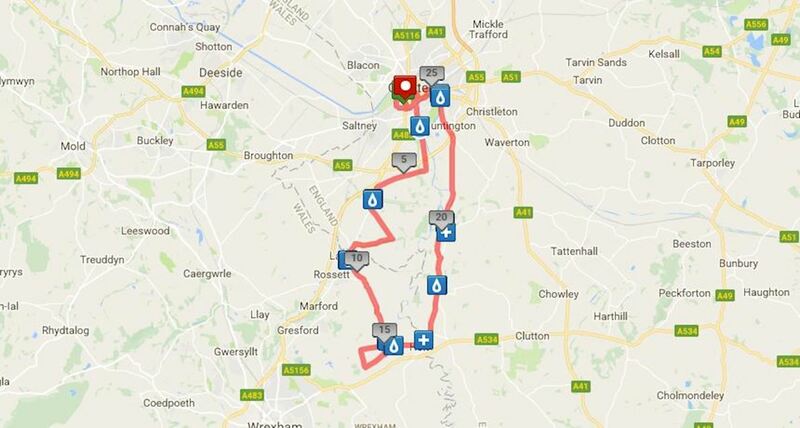 After leaving Chester Racecourse the Marathon course will pass through Chester City Centre, heading out through Eccleston and Pulford before entering Wales at Rossett. The route then passes through Holt before returning to England at Farndon and passing through Churton, Aldford and Huntington. It returns to Chester city at Boughton before entering the Groves area and returning to the racecourse past the Little Roodee. See our route maps. The Metric Marathon course will pass through Chester City Centre and then head out of Chester eastbound on the A51 and then south on Sandy Lane. Just north of Churton the runners turn and run north to return to Chester. The Chester Half Marathon offers a fast course and a spectacular city centre finish. You now run past some of Chester's historic landmarks at the very start of the race too. The updated route still starts at Chester Racecourse, before heading up Watergate Street, through the Walls and now enjoying the historic Chester city centre. Then you leave the city through the Garden Quarter before heading out into the countryside through the village of Mollington. At halfway the runners will start their return to Chester, via Woodbank and Saughall. The finish in the City Centre outside the Town Hall and Cathedral provides an inspiring setting with cheering crowds of welcoming spectators. 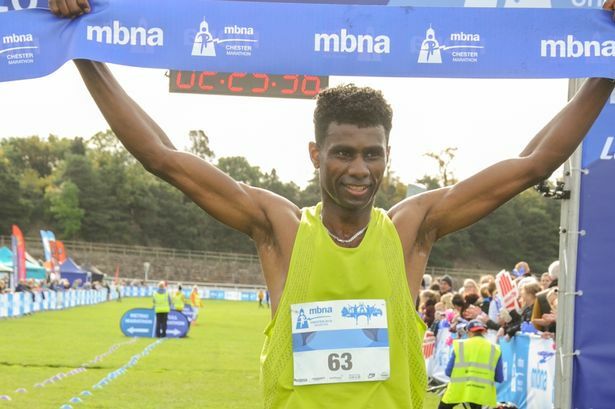 The MBNA Chester Metric Marathon is now a popular fixture in the race calendar, giving you the only opportunity in the UK to run over this distance. This is a 26.2km (16.3mile) race which is the ideal stepping stone from a half marathon to a full marathon. As runners ourselves we are passionate about delivering what for us would be the perfect race; a premier quality, competitively priced race which caters for the needs of runners of all. The route is on closed roads and you will run past all Chester's iconic landmarks (Roman Walls, Cathedral, Medieval Rows, Eastgate Clock, Amphitheatre) before heading out to the stunning Cheshire countryside and villages. After joining the marathon runners at Aldford you begin the return journey, coming into Chester alongside the River Dee for a unforgettable finish at the Racecourse. The support in the villages and communities along the course is one of the many highlights of the race. Runners leave the racecourse and head into the City centre passing the Town Hall, Cathedral, split level Middle Ages "Rows", Eastgate Clock, Amphitheatre and through the Roman Walls before heading out of the City across the Old Dee Bridge. The route then leaves Chester past the Duke of Westminster's estate, through Pulford, before crossing the border into Wales and the villages of Lavister and Rossett. Keeping to the rural lanes runners complete a small loop before entering the historic village of Holt. Then crossing the ancient Roman bridge at Farndon to return to England and the home stretch running through Churton, Aldford and Huntington. On re-entering the City, runners pass the River Dee along the Groves and Castle Drive before a triumphant finish at the race course!